The SkyWay transport solutions arsenal is constantly growing. 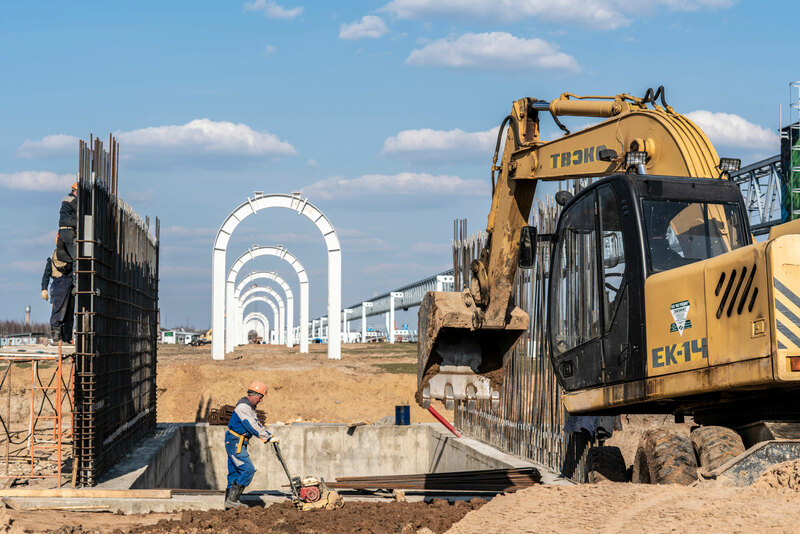 Attentive viewers could already notice a new element of the string transport infrastructure on our videos: the arched supports for the rigid track structure. 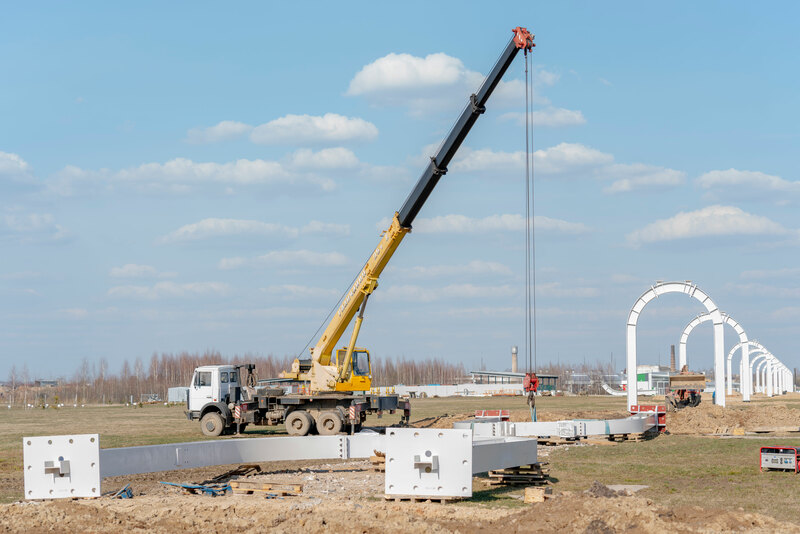 At the moment, the erection of the new track supports at the EcoTechnoPark is coming to an end, which means it's time to briefly talk about it. 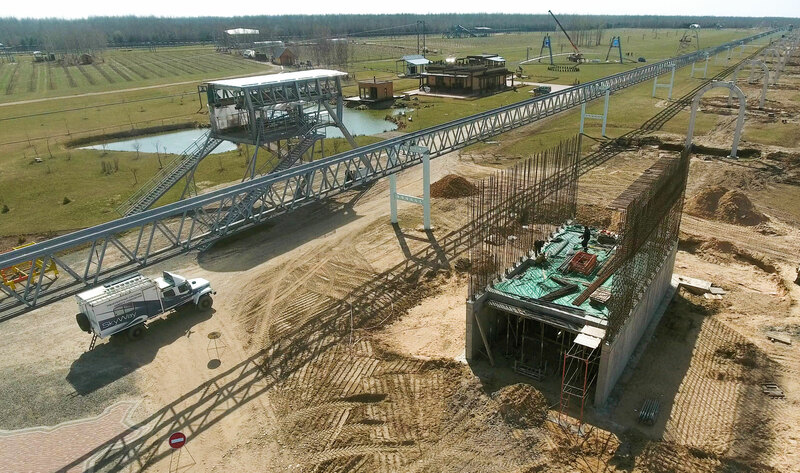 «Exhibition Sample of the String Communication Systems №5» – that is how the SkyWay developers call it – is a part of the track infrastructure, designed to perform the widest possible range of tasks within the framework of the most current importance targeted projects. After all necessary checks, it will be used for the movement of the rolling stock cargo and passenger samples. Moreover, the new track, as well as the truss rail-string flyover, already functioning at the EcoTechnoPark, was developed for both mounted and suspended vehicles. «Number Five» will be suitable for transport modules up to 50 tons. The Unicont, a freight vehicle for the transportation of ISO containers, will be tested on this section of the EcoTechnoPark. The other novelties of the rolling stock: mounted and suspended passenger and cargo modules for one and two rails, will be also run in on this track. The SkyWay technologies continue to be developed. New solutions that meet the most complex market requirements are being designed, tested and applied in the shortest possible time. SkyWay is growing, as without constant growth it is impossible to achieve success in modern dynamic conditions. Thanks to continuous development, we already offer the most popular solutions to the most complex problems. What's more, we clearly see the future and create technologies of the future that will help to cope with the growth in traffic volume and aggravation of transportation problems. Follow the news of the project, in which we will continue to talk about novelties and news of the string transport. We will detail you about this track and its purpose a little later. Feel free to ask questions on this and other topics on social networks.